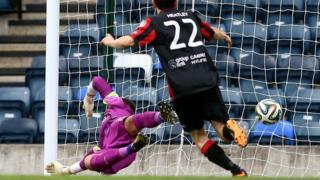 Crusaders beat Linfield 2-1 at Windsor Park to earn three points and move up to third position in the Premiership table. Colin Coates marked his 400th goal for the Crues by firing home a free-kick and a fine goal by Paul Heatley extended the advantage. Andy Waterworth reduced the Blues' arrears, but Warren Feeney's side were unable to find an equaliser.